Need a hand choosing the best Fujifilm camera? Fujifilm's camera range includes high-end pro models, compact 'street' cameras, novice-friendly mirrorless models and even an underwater camera – and we'll help you pick the right one for you. You might also want to check out or best cheap camera guide. 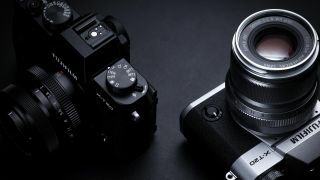 Fujifilm's probably best known for its mirrorless cameras, which take interchangeable lenses and split into two categories, the more advanced of which have mini-DSLR styling with a conventionally placed (electronic) viewfinder, while the entry-level modes have a smaller rectangular shape and ditch the viewfinder. Fujifilm has dropped most of its compact cameras as it concentrates on its mirrorless models, but it still makes the terrific little XP130 (there's a new XP140 too) underwater camera for holidays, travel and general family use. At the other end of the scale, Fujifilm has also pioneered the introduction of medium-format digital cameras into the mainstream market, and we've included the big but beautiful GFX 50R in our list. As usual with our buying guides, we start off with the camera we think is the best all-round choice for most people, followed by a couple of cheaper options for those whose pockets aren't so deep. After that, we head into specialist territory with different cameras aimed at different types of user. So if you don't see the right camera for you straight away... keep scrolling! So new we've only just finished testing it, the X-T30 is the replacement for the much-loved Fujifilm X-T20, with slightly more resolution, vastly improved autofocus and the ability to shoot at up to 30fps with its electronic shutter and 1.25 crop mode. The 4K video capabilities are improved too, and while the X-T30 can't quite compete with the bigger X-T3's professional level video capture, its autofocus is actually slightly more advanced. If you want a small, affordable, all-round APS-C camera that's right at the cutting edge with image quality and features, this is it. We reckon you'll also be charmed by the X-T30's old-school external shutter speed dial and exposure controls. A thing of beauty, the Fujifilm X-A5 has a gorgeous retro design with some really clever touches, like its 180-degree tilting touchscreen and Portrait Enhancer for selfies, as well as an advanced autofocus mode that finds the subject's eye. As we’ve come to expect in X-series cameras, there’s 4K movie capture but it’s somewhat hamstrung by a 15fps frame rate. The megapixel count for stills is pretty impressive at 24.2MP but, in keeping with the compact lightweight design, there’s no viewfinder, so you have to rely on the LCD for composing shots. With more stamina than various other X-series cameras, this one has a battery life of around 450 shots. If you're moving up from a smartphone, you won't miss the viewfinder but you will love the image quality. Fujifilm does not make full frame cameras. It goes straight from its APS-C models like the X-T30 and X-A5 to a much larger medium format sensor in its GFX models. The first was the GFX 50S, but we really rate the newer GFX 50R, not just because it has a neater rectangular shape but also because it's only three-quarters the price! OK, so the price tag looks excessive compared to regular cameras, but it's a breakthrough for medium format cameras – and the larger sensor delivers a level of image quality that just blows you away the first time you see it (and for a long time after that, actually). It's big, it's heavy, and it's not that fast to use, but it's designed for a more considered kind of photography. The GFX 50R is in this list because it's brought medium format quality within the reach of many more pros and advanced amateurs than ever before. The X-Pro1 was Fujifilm’s first X-series interchangeable-lens camera and caused quite a stir. In terms of building advanced features and high-end performance into a relatively small, compact-style body, it squeezed a quart into a pint pot, but the revamped X-Pro2 is better in every way. Based around a next-generation image sensor and processor, it has a new hybrid viewfinder that offers both optical and high-resolution electronic displays, together with a faster 1/8000sec mechanical shutter speed, extra Film Simulation modes and a far better hybrid phase/contrast detect AF system. The body and viewfinder are especially well suited to Fujifilm's compact and affordable prime lenses. We're currently waiting to see if there will be an X-Pro3, but in the meantime, this is the closest you can get to a classic 'rangefinder' camera experience without buying a Leica! If you love the idea of the Fujifilm X100F but you're not so keen on the price, the little XF10 could be the answer. It's a much modest camera, without the viewfinder of the XF100 or its old-school shutter speed and lens aperture dials, but the XF10 does still have a 24-megapixel APS-C sensor and a very handy 28mm equivalent f/2.8 lens. Its two really appealing features, however, are its extra-slim body – which can easily slide into a jacket pocket, or even a trouser pocket – and its much lower price. It's easy to focus (sorry!) on its slightly sluggish autofocus and limited features, but where else will you get a pocket-sized premium quality APS-C camera at anything like this price? Finally, we wanted to mention one of our favourite go-anywhere family cameras. Small but tough, the Fujifilm FinePix XP130 is sufficiently shockproof to withstand being dropped from a height of 1.75m, waterproof to a depth of 20m, freezeproof to -10C and dustproof. It boasts a 5x optical zoom lens with an effective range of 28-140mm in 35mm terms, while the maximum continuous drive rate is pretty impressive at 10fps, and the LCD screen is fairly high in resolution (which is welcome in the absence of a viewfinder). It’s well-connected camera too, with built-in Low-Energy (LE) Bluetooth. There is a new XP140 just out, but the differences are minor and the old XP130 is still on sale, and great value.